The #1 secret to ensuring you stay strong and independent longer? Walk this way. I grew up, like so many of my fellow boomers, in fear of turning into my parents. And like so many of us, I used that fear as motivation to eat better, exercise more, use sunscreen, and age as gracefully as possible. But long after my parents’ generation passed the torch to us, I still feel that dread. Not of getting old—I vastly prefer it to the alternative—but of looking old. That thought came back to me on a recent Saturday morning in the grocery store. It seemed like all the older people pushing carts had a similar side-to-side movement in their hips and shoulders when they walked. As they stepped forward with the right leg, they would lean to the left. On the next step, they’d lean to the right as they moved the left leg. The walking pattern is so common it has a name: Trendelenburg gait. 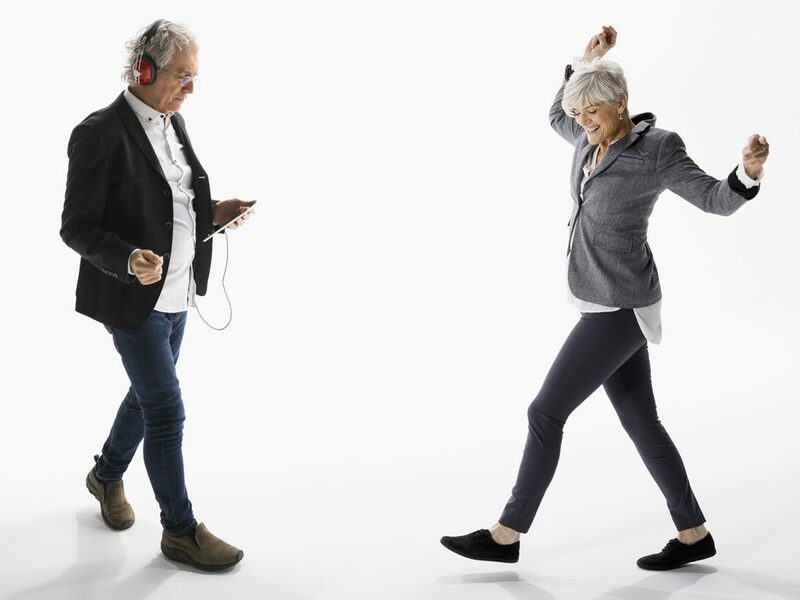 It’s often seen in older adults who need or have recently undergone a hip replacement, which makes sense since the signature feature is an inability to hold the hips level when walking. “With women, the pelvis will literally go side to side, like a bell,” says Michael Stare, D.P.T., a physical therapist and owner of Spectrum Fitness Consulting in Beverly, Massachusetts. With men, you’re more likely to notice that their upper torso leans over the supporting leg when the other leg comes off the ground. You can picture it like this, Stare says: Imagine an elderly couple walking down an extremely narrow hallway that’s just been painted. The woman with Trendelenburg will end up with paint on her hips, and the man with Trendelenburg will have paint on his shoulders. But it’s still the same thing, and it has real consequences. 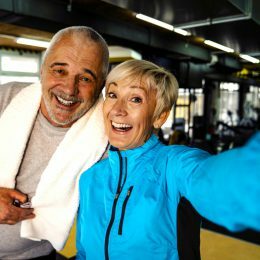 Fortunately, by doing a few simple exercises regularly, you can help avoid the age-related changes in gait and the problems associated with them. More on that later. Stare points to a 2016 study from Dalhousie University in Nova Scotia. Healthy volunteers were shown how to walk like people with Trendelenburg. 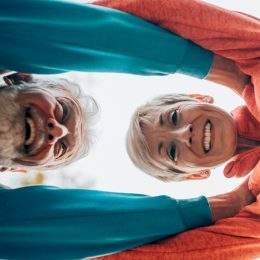 When their pelvis dropped four degrees to one side, the knee on that side shifted inward 23 percent more than it would with a normal walking pattern. Over time, Stare says, that kind of stress on the knee joints will wear down the protective cartilage, decrease the amount of space between the leg bones, and increase the risk of arthritis. It also takes more energy to walk, which means you’re less likely to get the exercise you need because every step is harder—and eventually, more painful. It’s important to note that an altered walking pattern can have lots of potential causes. In a long-running study of elderly Italians, about one-third of those between 60 and 97 had gait disorders. And many were related to neurological issues like Parkinson’s and dementia. When gait problems are all or mostly physical, Stare says, the most likely culprits are weak hip abductors. Those are the muscles on the outside of your hips, the most important of which is the gluteus medius. If you’ve ever used the abductor machine at the gym, you know they’re responsible for pulling your thighs away from your body. They also have a crucial role in stabilizing your knees, which helps prevent knee pain along with gait changes like Trendelenburg. That’s why the exercises Stare recommends work your core and lower body in coordinated action, with the goal of increasing strength, balance, and movement quality while also preserving muscle tissue. Before we get to the exercises, let’s see where you are now with the test used to check for Trendelenburg. You’ll need a stopwatch or a clock that shows seconds. Stand in front of a mirror with your hands on your hips. Lift your right foot off the floor, and hold that position as long as you can. Stop if your pelvis drops or you lose your balance. Repeat with your left foot off the floor. You should be able to hold steady for at least 30 seconds per side. “That’s the minimum standard,” Stare says. If you can’t, you may have—or could be on your way to—Trendelenburg. 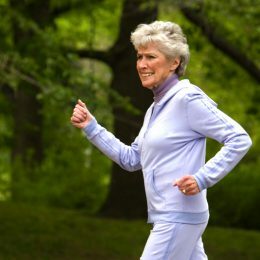 In that case, the following three exercises can help restore your youthful stride. As always, safety is key. The exercises here may be different or more advanced than those you’ll experience in a SilverSneakers class. If you have a chronic condition, balance issues, or injuries, talk to your doctor about how you can exercise safely. How to do it: Like the self-test, you want to do this one in front of a mirror. Roll up a small towel, and place it perpendicular to the instep of your right foot. If your feet are shoulder-width apart, the towel basically connects the insteps of both feet. Put your hands on your hips. Lift your left foot, and tap your toes on the floor in front of the towel. Immediately lift your foot again, and tap it on the floor behind the towel. Keep your weight entirely on your right leg and your hips level. Keep tapping in front of and behind the towel for at least 30 seconds, then switch sides and repeat. If you work out in a gym, you’ve seen lots of people doing side planks, and if you work out with a trainer, you’ve probably done your share. They’re popular for a reason: They work everything on the side that’s supporting your weight, especially the core muscles in your hips, abs, and lower back. That means they also work the gluteus medius, Stare says. How to do it: Set up on a mat or towel with your weight resting on your left forearm and the outside edge of your left foot. Set your right foot on top of your left. Lift your body so it forms a straight line from neck to heels. Rest your right hand gently on your left shoulder, hip, or on the floor for support. Hold for 30 to 60 seconds, switch sides, and repeat. If you can’t quite do 30 seconds, hold as long as you can. Sets, reps, and frequency: Do up to three sets of 30 to 60 seconds per side. You can do them every day. If that’s unrealistic, shoot for a minimum of three times per week. It works the whole lower body on the side of the working leg—from the foot to the calf, thigh, and hip—along with the core muscles. The gluteus maximus and medius work especially hard when all your load is on that side of your body. How to do it: Stand with your back to a chair or bench with your heels a few inches away from it. Cross your arms over your chest, and lift your right leg off the floor. Tighten everything in your torso, and carefully push your hips back. Lower your body until your glutes touch the chair or bench behind you, or as close to the chair as you can comfortably go while keeping good form. Push through your left foot to stand back up. That’s one rep. Do four or five reps, switch sides, and repeat. Make it easier: Place a pillow or pad on the chair to decrease the range of motion so you don’t have to squat as low, Stare says. If standing on one leg is too difficult, keep both feet on the floor, but shift your weight to one side. Still too challenging? Figure out the best way to make squats work for you. Sets, reps, and frequency: Aim for three sets of four to five reps per leg. Try it three times per week on nonconsecutive days. If you’re stronger and more ambitious, you can work up to 15 reps per set.